Remembering Freedomland U.S.A. ~ The History Girl! For the last 40-plus years, I have been a journalist, public relations executive and historian, writing and speaking about many different topics. During all this time, though, I never forgot about that wonderful place where it all began for me. About 10 years ago, I realized that I needed to “return” to Freedomland. With the arrival of social media, I created a popular memory page on Facebook that has expanded to Twitter and Instagram. Now, in a new book, I am able to document the full story of that beloved theme park and to tell all who were there, and the many others who wish they had experienced it, about its proper place in American theme park history. 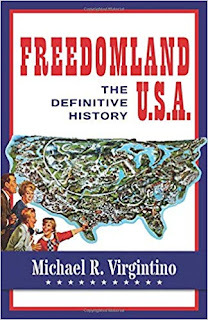 The following is an excerpt from Freedomland U.S.A.: The Definitive History (Theme Park Press). It lasted only five seasons (1960-1964), but Freedomland still is recalled fondly by the baby boomers who enjoyed its historical magic. Anyone seeking a carnival atmosphere enjoyed Brooklyn’s Coney Island and Rockaways’ Playland in Queens. Some people traveled to Palisades Amusement Park along the Hudson River in New Jersey, or Rye Playland, which continues to operate today in Westchester County. Small neighborhood amusement areas could be found throughout the five boroughs of the city, in Westchester, and along Long Island. Freedomland U.S.A. was different than the conventional amusement parks. It was a theme park that featured the story of America through attractions that included Fort Cavalry, the Chicago Fire, the Civil War, and the Northwest Fur Trapper ride. It even embraced the present and future of space flight. 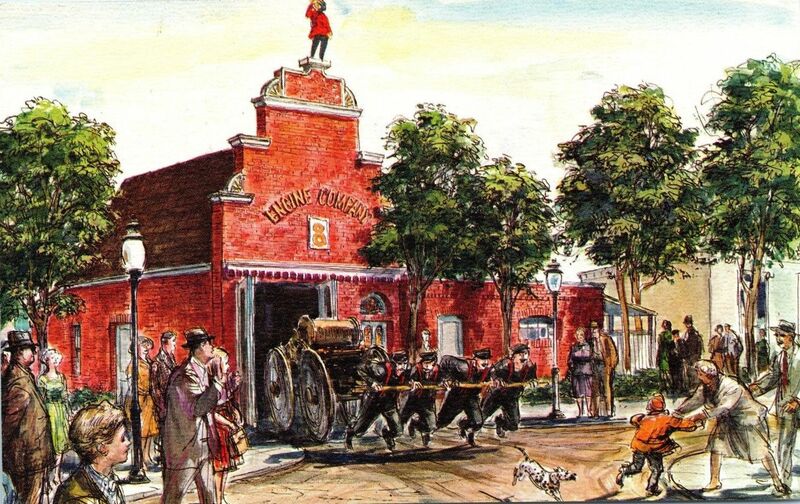 The Chicago Fire House at Freedomland U.S.A. The park used an actual mid-1800s fire fighting water pump. The research and design team that created and constructed Freedomland consisted of about 200 leading artists and architects. Many were former Disney employees. Others were veterans of the film industry. The Bronx location for the theme park was a 205-acre site at the southern part of about 400 acres of marshland. The park and its attractions would be located on 85 acres, with the remaining 120 acres reserved for maintenance and parking. 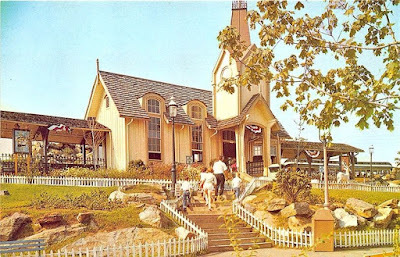 Freedomland’s grand opening had been scheduled for June 1, 1960. It then was rescheduled for a month later to ensure that the park would be ready for the anticipated crowds. Due to the growing excitement generated by aggressive advertising, marketing, and the on-air promotion by the city’s popular music radio stations, the official opening date again changed to June, specifically to Father’s Day on Sunday, June 19. Take me out to Freedomland. Look out the flames are getting higher. You’re right there on the spot. Freedomland U.S.A.: The Definitive History is a new book that documents the entire story from conception to bankruptcy of one of the most innovative and beloved theme parks in America. The park was conceived and built by C.V. Wood. Known to many as Woody, he was Disneyland’s first employee and he brought Walt Disney’s imagination to life by leading the team that built Walt’s park. He then created Marco Engineering to build theme parks and other venues across the country. Located in New York City, Freedomland U.S.A. was celebrated as the “Disneyland of the East.” While it survived only five seasons (1960-1964), to this day the park generates fond memories among baby boomers who enjoyed its American history-themed attractions. The 300+ page tale includes first-time interviews with park employees and never before published photographs. Michael R. Virgintino is a marketing communications executive who has directed corporate, nonprofit and product branding initiatives that rely on public relations, public affairs, corporate social responsibility, community relations and related strategies. He also is an historian who writes on diverse topics and provides communication services to historical sites and organizations.